If you’re intent on building an amazing portfolio of camera and video equipment, sometimes it’s the smallest things that make all the difference. Considering everything you need from cameras, recorders, and other video products, it does no good if you don’t have the perfect bag to haul all of your gear. Hauling your personal inventory from shoot to shoot while keeping everything inside secure in an easy to carry and store handheld makes your entire photo and recording experience worthwhile. This is where Tripod & Monopod Bags and Cases come into play as securing your investment while making it possible to move from place to place to capture your next experience. Looking for the right bag or case which gives you plenty of options for storage to hold lenses, your tripod, and everything else you need is easier than you think, as long as you keep reading. The following review showcases the Top 5 Tripod & Monopod Bags and Cases while considering storage, portability, price and much more. The VidPro TC-22 is this year’s best option if you’re looking for plenty of storage for tooting your tripad and other accessories from shoot to shoot. This high quality and high affordable tripod back accommodates longer tripods up to 22-inches long. The VidPro offers a great deal of padding and storage options both inside and out. The Vivitar delux tripod case bag features an integrated strap and comes in just under $15. This affordable tripod carrying bag fits most tripods up to 35-inches long and features an easy pull zipper which makes opening and closing the bag a breeze. The top flap gives you easy access to everything inside and the plush padding secures your investments which protects from impact, dust, moisture, and dirt. 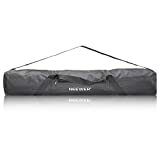 Another affordable and high quality tripod and monopod is this Neewer carrying case which accommodates light stands, tripods, monopods, and boom stands. This versatile carrying case boasts a strap which makes carrying practical, and with the lightweight, but durable Cordura webbed nylon you’ll be using it for years to come. 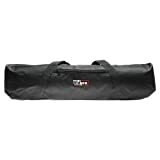 Included is a large zipper on the outside for carrying your accessories, is made of weather resistant vinyl, and can fit a tripod up to 36-inches long. VidPro introduced another option for carrying your tripod or monopod which is a padded bag which accommodates up to a 27-inch folded tripod. The bag itself is made of a very durable, lightweight, and heavy duty Cordura webbed nylon which is weather resistant. Included is a shoulder strap which makes carrying practical and a large exterior zipper pocket for carrying all of your essentials. The most budget friendly case in this review is this tripod bag from Slik. Giving you the ability to store and carry a 24-inch fully folded tripod or monopod which also features a durable nylon shoulder strap. Complete with a zippered opening for ease of access and an ID pocket with window and zipper enclosure you can store and tote everything you need in one convenient and easy to carry bag. If you’re considering picking up one of the above and have any questions, be sure to ask them in the comment section below. If you’re intending on picking one up, please come back and share your experience with the rest of the community.